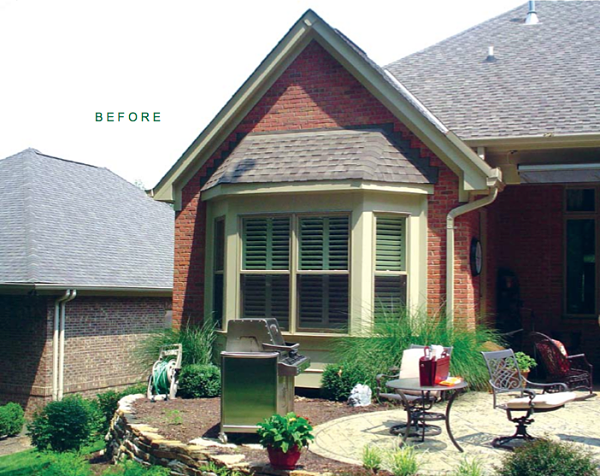 If you’re planning a remodeling project, you’ve probably spent some time browsing through “Before” and “After” photos of projects other people have done. It’s helpful to see how spaces can be transformed. This month we are introducing a new feature to our blog, “Project Spotlight”, where we will show before and after photos of recent projects and provide details, including a discussion of the homeowners’ objectives and designs we created to help them achieve their objectives. 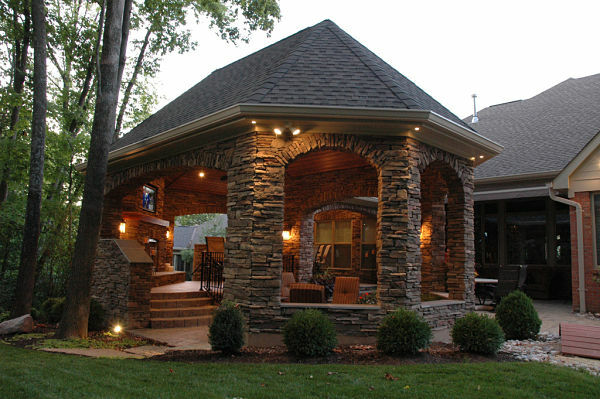 This month’s project features a stunning outdoor living space. 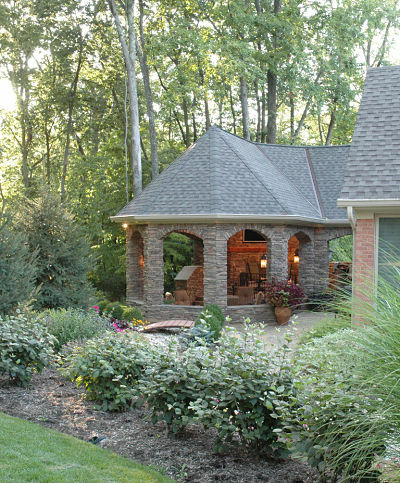 The owners of this beautiful home love both nature and entertaining. They envisioned an “outdoor room” that could be a quiet year-round retreat as well as a place to host parties and entertain guests. A large outdoor living space for both day and evening enjoyment. A seamless design that blends with the architecture of the home. A TV area large enough to accommodate a crowd of 50 or more people. 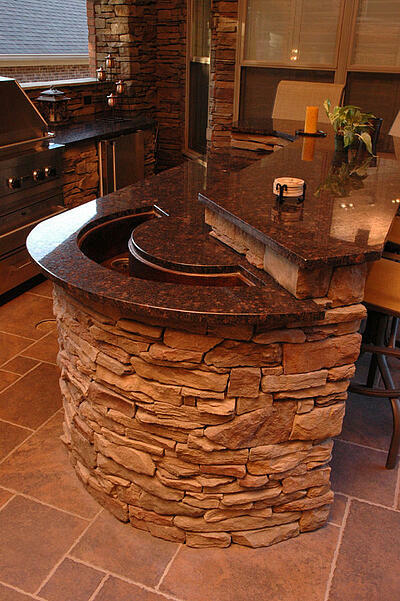 A kitchen and beverage center. Integrating the new space with both the first floor and the lower level of the home. Creating a design and plan that would respect the established budget. 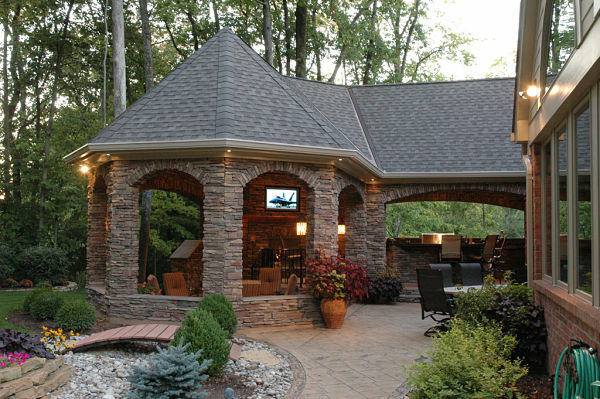 The homeowners desired a large multifunctional outdoor living space to blend with the natural surroundings. However, the project would also require approval from the neighborhood review board. The severe drop-off of the property required a multi-level plan to attain the space required by the homeowners. The scale of the project was especially challenging. The outdoor room had to be dramatic yet complement both the home and the outdoor setting. It also needed to feel warm and inviting. For access, it was important to connect the outdoor addition to the first floor and the lower level of the home. Connecting it to the lower level was very challenging. Staying within the budget and providing all of the features required by the homeowners. A multi-level design with sections that define the functional space was created for this project. The design also considered how people would move within the structure from level to level. To complement the home’s architecture and the outdoor setting, we designed a 675-square-foot outdoor room that is stunningly tall yet cozy and inviting. Careful fiscal management kept the project within budget. Cost containment strategies included the use of trusses as opposed to ridge beams to create a magnificent vaulted ceiling. In dealing with the grade of the side yard, stone pavers were used instead of stamped concrete, resulting in additional savings. The design incorporated the gables of the original home, a move that helped to contain costs and to seamlessly blend the addition with the existing structure. The spectacular architectural design combines a veranda leading from the home and a gazebo. Within the veranda are a multi-tiered island and bar and a galley-style kitchen. There is also a fireplace set at an angle with a television and an area for dining. 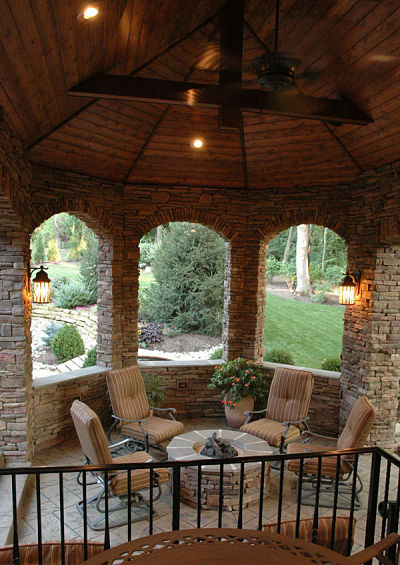 The gazebo has a high vaulted ceiling, a gas firepit and seating for six. The gazebo opens to a large patio with additional space for seating and dining. There is a footpath surrounded by gardens that leads back to the house. 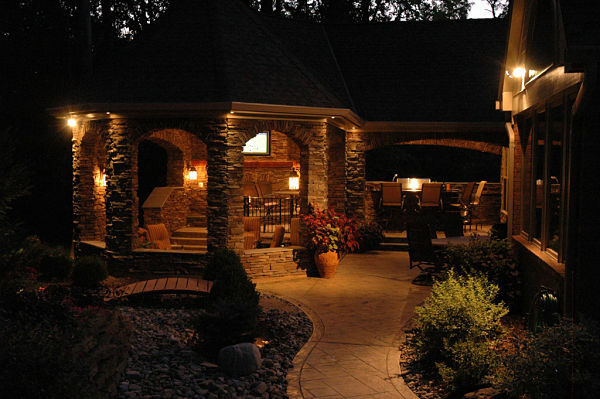 Lighting was installed to create an ambiance at night. Sconces and uplighting accentuate the architecture and overall design of the space. Ceiling fans also are lit. Wall lights guide visitors through the space in the evening. The galley style kitchen is equipped with restaurant quality appliances from the Viking Outdoor Series including an oversized grill and warming drawer to feed a crowd or prepare an intimate dinner for two. There is also a beverage center. Architectural elements of the project, including the ledgestone wall surfaces, stamped concrete flooring and patio and multi-level granite counters, are artistic and functional. A unique crescent moon shaped sink with its dramatic design reflects the round architectural form of the outdoor structure. 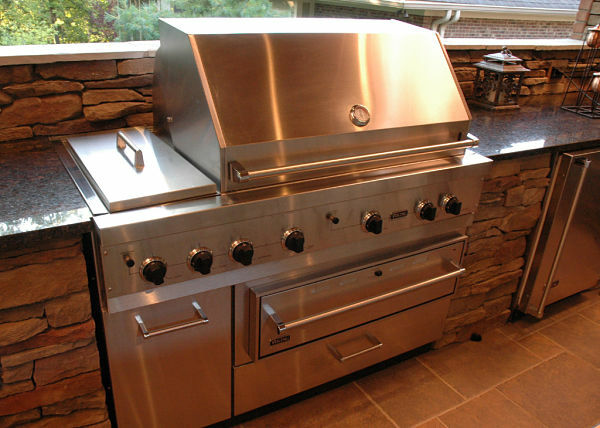 Appliances include a beverage center, grill with side burners and a warming drawer. During cool evenings the outdoor room is warmed by both a gas fireplace and gas firepit. 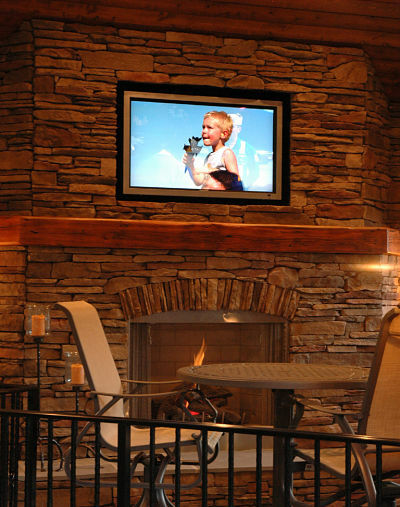 A large screen outdoor television was placed over the gas fireplace to be viewed at any angle in the shelter. Curved footpaths, a bridge, plantings of shrubs, evergreens, perennials and annuals create an inviting garden for guests to gather. This project recently won a regional and local “Contractor of the Year Award” in the ‘Residential Exterior Category’ from the National Association of Home Builders. To see more photos of our projects go to the “Idea Center” on our website and view “1000 Design Ideas for Your Home”.